Digital Audio Film is one of series of films which aim to refute technological narratives of progress and simplistic divisions between analogue and digital by finding commonalities across media history. 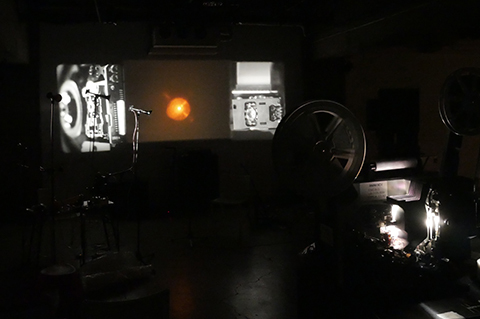 Blank film stock is exposed to the laser pick-up of a portable CD player, transforming the machine from an audio playback device into both projector and camera. 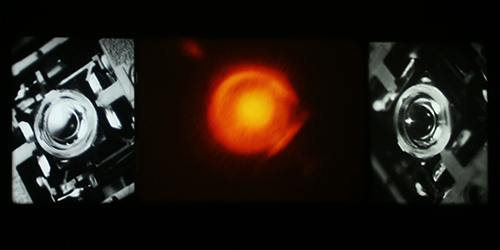 The film reframes the data reading function of the device as an aesthetic action, inscribing a flickering dot of light, normally invisible to the naked eye, in the emulsion of the film. In doing so the work aims to bring these two optical media, one of sight and one of sound, into an anachronistic dialogue, allowing them to reveal one another’s materiality and finding a compatibility between these apparently mutually exclusive media which pushes both beyond their designed function. Commissioned for Ftarri Festival 2015.